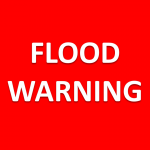 The National Weather Service in Omaha has issued a flood warning for Salt Creek At N 27th Street in Lincoln from this evening to Thursday evening…or until the warning is cancelled. Do not drive cars through areas where water covers the road. The water depth may be too great to allow your vehicle to pass safely. Turn around…don`t drown! At 10:36 AM Wednesday the stage was 15.9 feet…or 4.6 feet below flood stage. Flood stage is 20.5 feet. Minor flooding is forecast. The forecast is for the creek to rise above flood stage by this evening and continue to rise to near 20.7 feet by this evening. The river will fall below flood stage after midnight tomorrow. At 20.5 feet…Overflows occur upstream of the levee, Calvert Street and upstream, and downstream of the levee just below the railroad bridge near the gage.